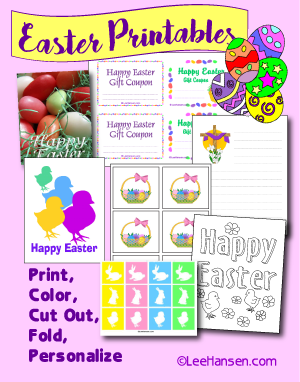 Beautiful Easter greeting cards to print, cut and fold and send to family, friends or pastor! Each Adobe PDF printable sheet prints 2 beautiful photo cards in your choice of designs as shown. Printable Easter cards are blank inside for you to add your personal note. 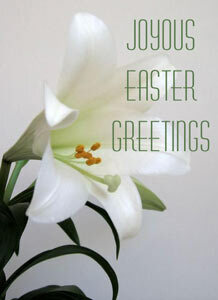 Beautiful single white lily photo with Joyous Easter Greetings text. For best results, print on photo paper, matte or glossy finish. 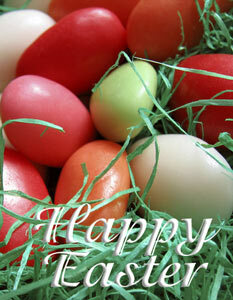 Red, pink, orange, white and green dyed eggs on a nest of green Easter grass with Happy Easter message on front. Using a cut out greeting card as a guide, cut a slightly smaller liner sheet from vellum or pastel paper. Fold the liner sheet in half to match the card, then tack glue the liner to the inside of the card along the fold lines. Write your Easter greeting on the liner sheet pages. You can also add dried flowers or ribbon trims to embellish your hand made Easter cards. Print photo greeting card sheets on heavy weight photo paper or card stock, then trim along the guide lines. Score along the crease line using a bone folder before folding your card. Browse our site shops to find ideas to design your own unique greeting cards, paper crafts, decorations or party favors. 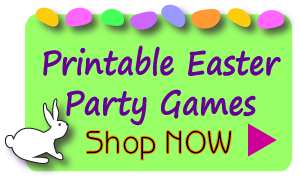 Visit the Easter party games shop!